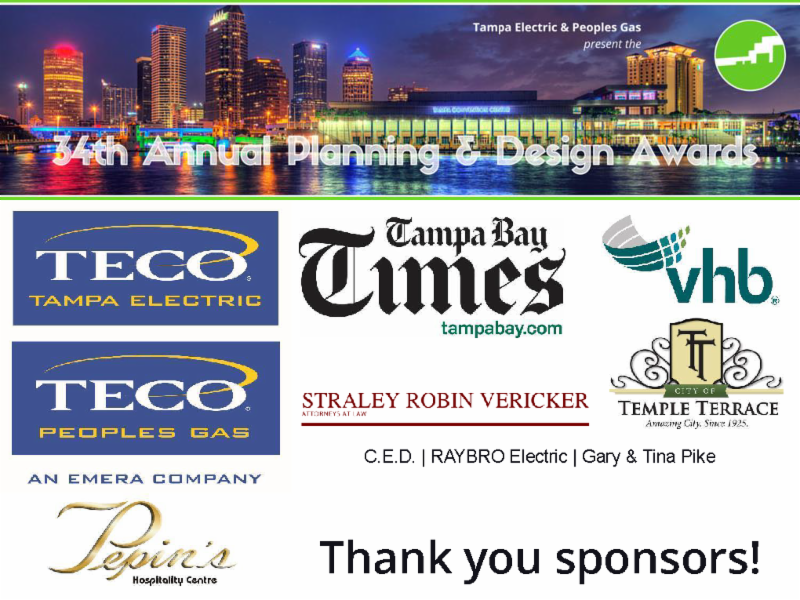 The Planning Commission is proud to announce the winners of our 34th Annual Planning & Design Awards presented by Tampa Electric and Peoples Gas. The event was held on October 20 at T Pepin’s Hospitality Centre. 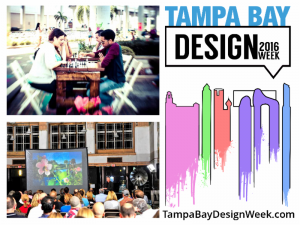 With the emphasis on the importance of great planning and design in our own region, our awards program aligns with Tampa Bay Design Week and the many national festivities during the American Planning Association’s (APA) National Community Planning Month and celebration of Great Places in America. 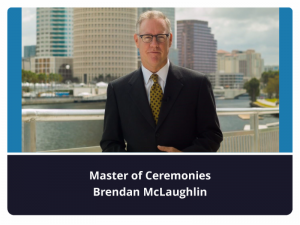 Awards of Merit, Excellence, and Outstanding Contribution to our Community as selected by a panel of expert judges from outside of Hillsborough County were presented by Brendan McLaughlin. Photographs of the event and award winners will soon be available on our facebook. A visit to Perry Harvey, Sr. Park is a stroll through rich, local cultural history. After the Civil War, freed slaves were relocated to the area called The Scrub. Over time it grew to become a successful African American residential and commercial district. This district along Central Avenue hosted a variety of businesses serving this community with restaurants, retail stores, services and cultural attractions. 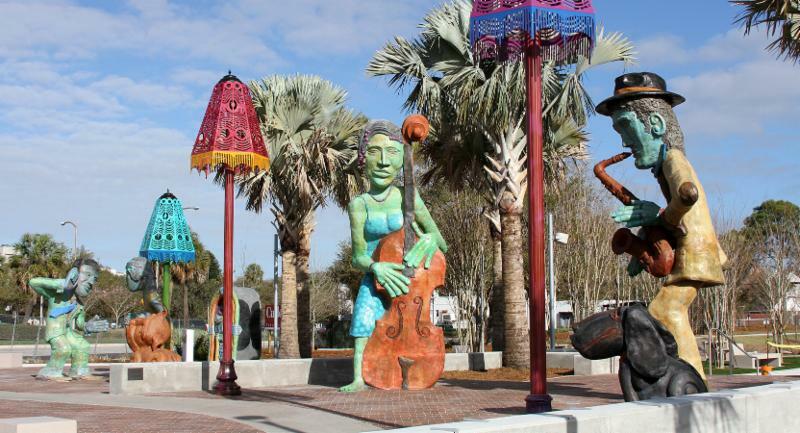 These cultural attractions became legendary, bringing nationally known artists to Tampa, including: Ray Charles, Cab Calloway, Ella Fitzgerald, James Brown, Hank Ballard, and many others. In fact, ‘The Twist’ was invented at an entertainment venue along Central Avenue, inspiring the song made famous by Chubby Checker. Perry Harvey, Sr. Park celebrates this history in a big way by incorporating custom artwork, sculptures, historic photos, and plaques describing the evolution of this neighborhood. An interactive fountain hosts a musical water and light show during the evening. A performance and event multi-purpose space is capable of hosting large concerts and festivals. Also of note is the re-creation of the old skatebowl at the north end of the park, after several years of undergoing a federal review process. Tying it all together is a system of walks through active and passive areas that include basketball courts and picnic tables. This gem of a park offers something for everyone to enjoy on a daily basis. Our judges felt this park hit all the right notes, balancing neighborhood context, local history, storm water, recreation needs, and cultural heritage. So, they took this entry submitted as a park in the Entertainment Category and elevated it to an Outstanding Contribution in Historic Preservation. 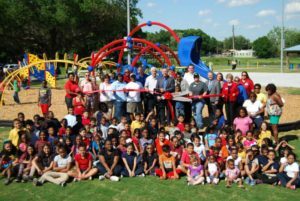 Beyond excellence as a community park, Perry Harvey, Sr. Park is literally a colorful, engaging, outdoor historical treasure celebrating the significant local heritage and the cultural fabric of this neighborhood. This mixed-use development to assist the many homeless persons in the City of Tampa was completed in 2015. Throughout the process, every member of the team, from board member to construction laborer, was focused on the ultimate goal of providing a hand-up for our fellow human beings. This comprehensive team effort built a village – a safe place for the homeless to be provided with a second chance in life. MiraclePlace offers our less fortunate community members the environment, infrastructure, and tools to lift themselves up. 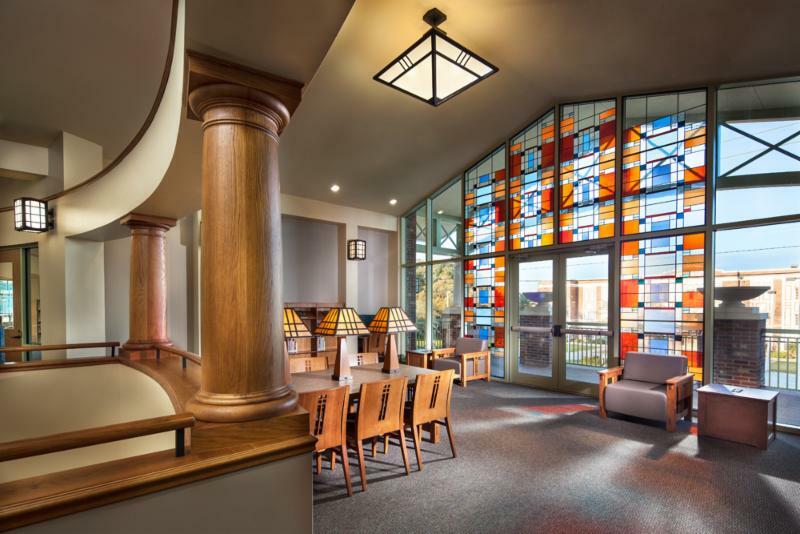 This village of hope includes 50 new 450 sq ft apartments, day care and counseling centers, a gymnasium, a youth enrichment center, a welcome center, and a Chapel of Hope.The existing dining room and kitchen were enlarged and modernized. 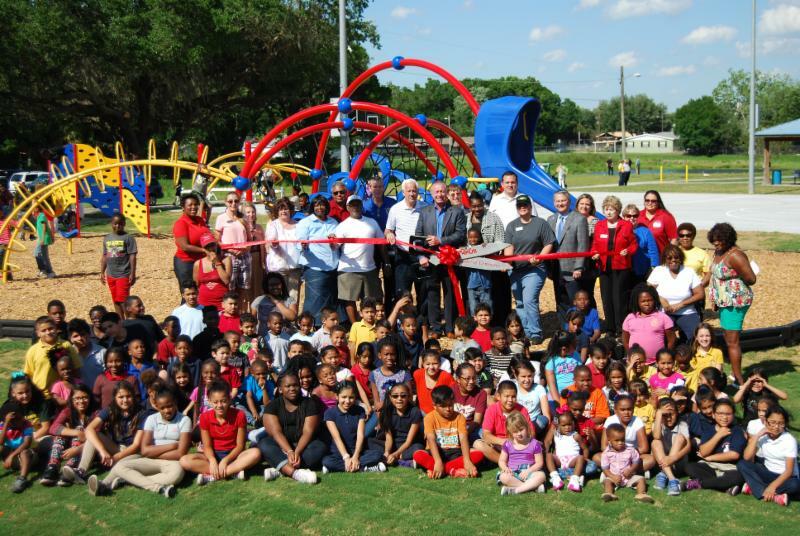 Just across the street, Metropolitan Ministries partnered with the School District of Hillsborough County to provide a new elementary school for the homeless children and for the neighborhood families of historic Tampa Heights. vision, planning, design, and promotion. Gorgeous facilities and thoughtful programming offer dignity and hope to those with the greatest need in our community. This project exemplifies everything planning and design to improve the quality of life in our community means. The dedication of the entire Metropolitan Ministries MiraclePlace team is admirable and an inspiration to all of us. 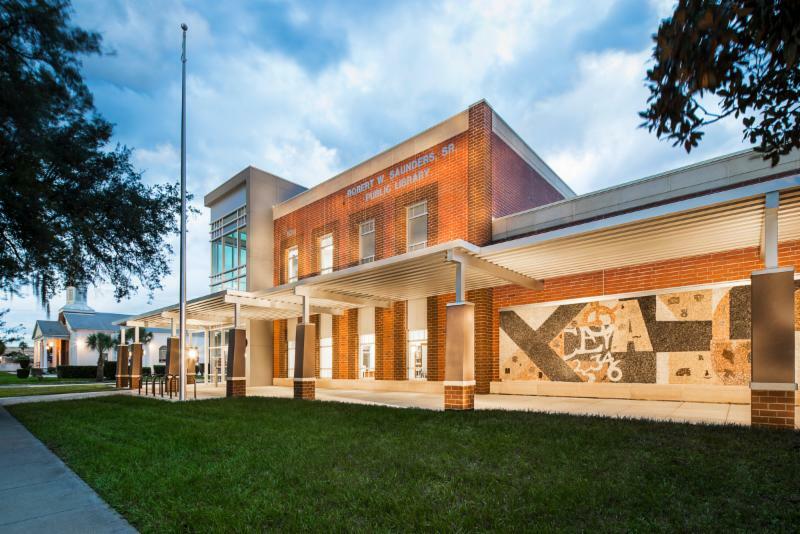 Located on the edge of Ybor City and just north of Tampa’s historic Union Station, the Robert W. Saunders Sr. Public Library serves as a hub for the diverse surrounding community. 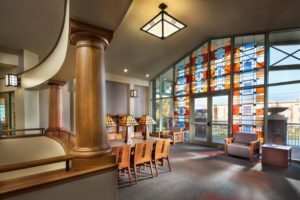 Originally built in 1933 and updated in the 1960s, the library was redesigned as a 21st century facility that also serves as a canvas for local history. 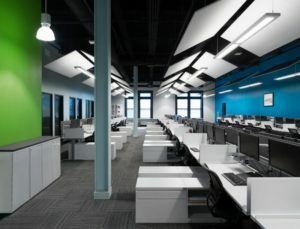 A 50-foot long wall art mural from the original facility was preserved and reborn as a key feature of the new two-story facility that provides patrons with state-of-the-art technology, public computer access, and WiFi connectivity. Local art and history displays are the central theme of the impressive design that also includes large public meeting spaces, a covered drop-off driveway, and the preservation of several grand oak trees. The judges loved checking out the features of this amazing community resource. The level of intergovernmental coordination taken created so much more than a fantastic library. 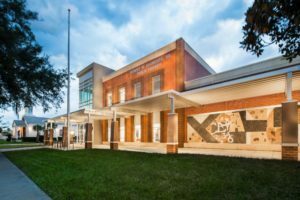 With the inclusion of a children’s library shared with the adjacent elementary school, a local history gallery, and an area devoted to African American history and genealogy research – all show incredible thoughtfulness and respect for the surrounding neighborhood – creating a public institution that truly is a great source of pride for this community!  A collaborative process that embraced and celebrated the Hillsborough River and the waterfront, the InVision Center City Plan developed in 2011 for downtown and the surrounding residential communities proposed a larger connected district of livable places, connected people and provided mobility. Neighborhood charrettes with stakeholder input called for enhancing the pedestrian and bicycle environment linking residential neighborhoods with downtown. Downtown improvements included the modification of Cass and Tyler Streets into two-way streets from Doyle Carlton Drive to Jefferson Street. 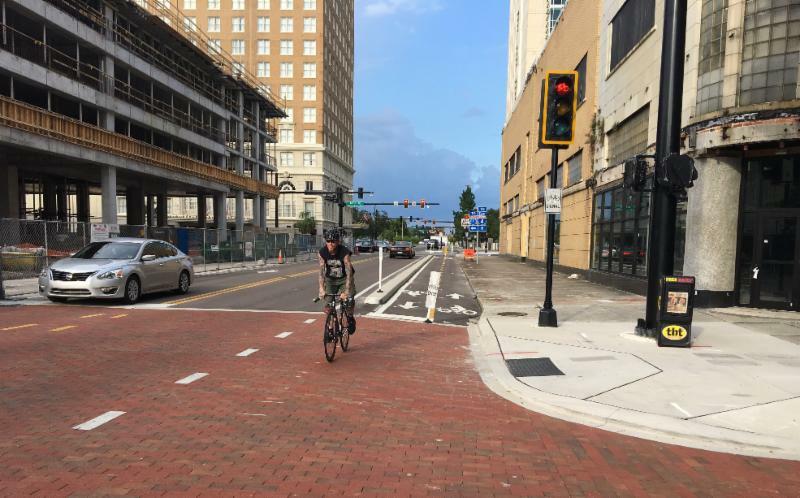 The improvements included construction of a segment of the Green Spine two-way cycle track from Gasparilla Plaza to Nebraska Avenue and shared lane markings. The judges thought this project was fully on track with promoting safe walking and bicycling while creatively drawing millennials who desire to live and work in that environment. Taking Tampa’s investment to the next level, state-of-the-art facilities and innovations like the activated signals foster a better sense of place for Downtown and will foster continued economic growth. 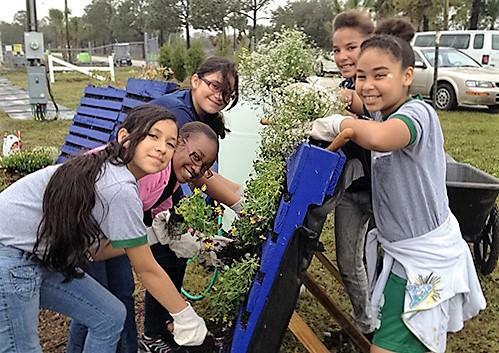 The Florida Learning Garden is a Keep Tampa Bay Beautiful project working collaboratively with many community partners, to design and plan the one-acre Learning Garden as a permanent interactive educational experience at the Florida State Fairgrounds. Featuring a variety of plant beds and hydroponics all for producing food, the garden also touts a Florida friendly landscaped walking trail, rain garden, more than 75 types of trees, a greenhouse, the Humana Educational Pavilion, sensory gardens, butterfly gardens, upcycled gardens, a composting system, a gazebo, the Cargill Windmill, an Enviroscape model, an interactive watershed display, and a Weather STEM system. All of this is used for educational presentations, community workshops, volunteer service projects, school field trips, and a summer camp providing hands-on agricultural and horticultural learning experiences for more than 40,000 students and for the 2.5 million visitors to the Fairgrounds each year. 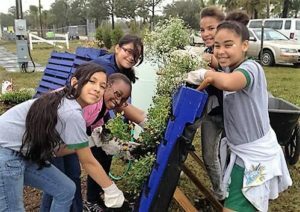 The Florida Learning Garden grew on our judges who wanted to visit for their own hands-on sustainable growing experience. They loved the design elements of this interactive classroom and the vast numbers of students and Fairground visitors able to partake in this garden of knowledge. Former residents and life-long lovers of historic Ybor City, David and Stephanie Bailey realized something was missing from the existing urban fabric: micro-development. 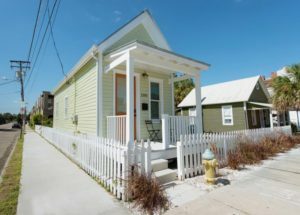 One Little House is a re-invention of the historic shotgun shack found throughout Ybor: simple, small, and contextually appropriate on the surface, but with cutting-edge building materials for both ease of construction and energy efficiency. Inside this home, a very cozy 365 square-foot plan works hard to provide a spacious feel, with a double-height living room and bedroom, a 90 square-foot loft, and multi-use furniture – proving it’s possible to maintain a high standard of living in a small footprint. As Ybor’s population ages, the need arises for a place to call home that will allow people to remain in – and an integral part of – their lifelong neighborhood while catering to their changing needs. The judges loved the airy feeling of One Little House and could see it meeting a multitude of housing market needs. They embraced the sensitivity to the historic context of the neighborhood while simultaneously providing modern-day environmental friendliness. Congratulations for making this one little house a dream home come true! Adopted by the USF Board of Trustees in December 2015, the comprehensive Campus Master Plan is the guiding vision for continued development growth and environmental improvements on the largest USF System Campus. Located in the City of Tampa, the site is already a 24/7 city within the city with nearly 17,000 employees serving over 42,000 students, with more than 5,000 currently living on campus. In the Master Plan, complete streets, multi-modal transportation options, safety improvements, a cross-campus greenway for open space and recreation combine with new infill development to increase density and connectivity to conserve naturals assets and reduce walking distances and heat island effects. The judges dug the urban feel and densification of the Master Plan. 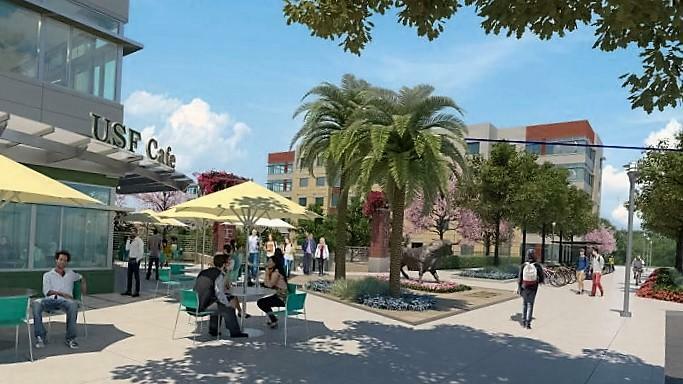 Exciting redevelopment of the north student housing district into a vibrant mixed-use residential village takes campus living to a new level. Prioritizing sustainable development to reduce USF’s carbon footprint, including LEED certified buildings, reduction of energy / water / waste and continued planting of shade trees takes the Campus Master Plan to the top of the class. Scoring high marks for lofty goals making this a unique institution that will serve as a model for other universities. The judges were sold on this project, finding it thoughtfully designed inside and out. 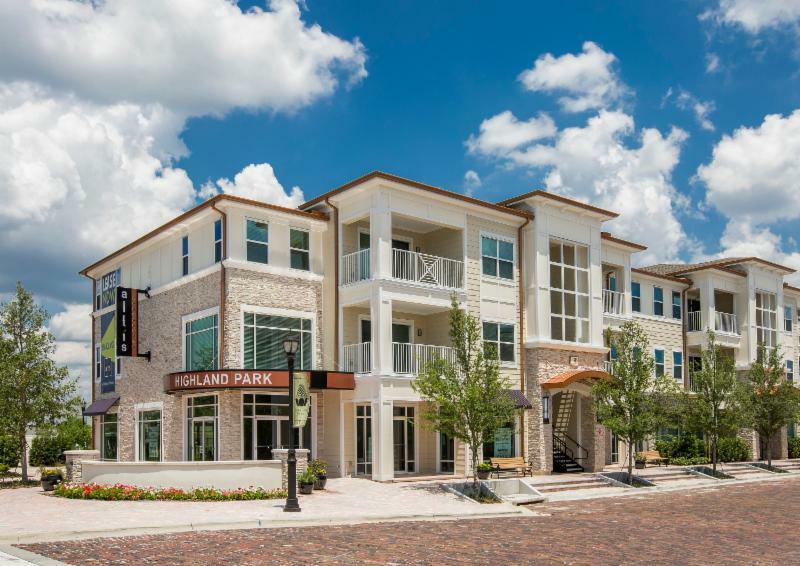 This innovative team re-purposed a struggling retail / theater facility into a successful mixed-use office / retail complex, creatively combined modern flare with Ybor City’s historic character. Congratulations to the entire Ashley Furniture team on supporting this community with adaptive re-use and mixed use development that enhances the local neighborhood with great design and economic development! As part of the redevelopment efforts of the City of Temple Terrace, a new zoning overlay code was developed to facilitate the Community Redevelopment Master Plan’s core objectives of creating a sense of place, a pedestrian-friendly environment, public squares and parks, a central open space, and a main street as part of a new street grid that encourages high-density mixed-use development. 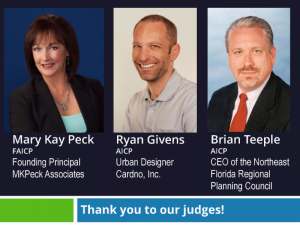 The judges applauded the out-of-the-box approach putting value on making vision a reality when it comes to mixed use development. This overlay is an investment in a more walkable and accessible community and an economically thriving future. 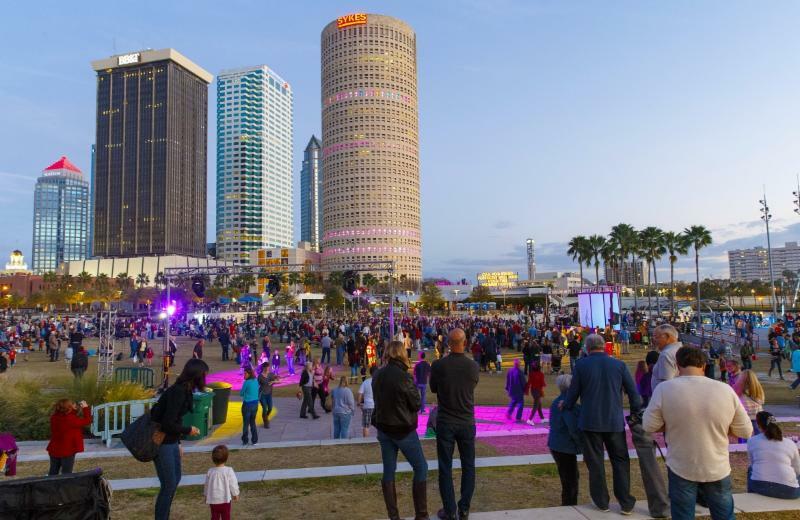 With a primary mission to raise Tampa’s visibility through and with the arts, Lights on Tampa’s combination of temporary and permanent light-based and new media art installations has brought over $4.5 MIL in art to Downtown Tampa over the last decade. The program broadened its vision in 2012 with the Agua Luces bridge lighting recognized as an iconic Signature of Light for our beautiful city. The judges basked in the glow of this unique celebration of light. 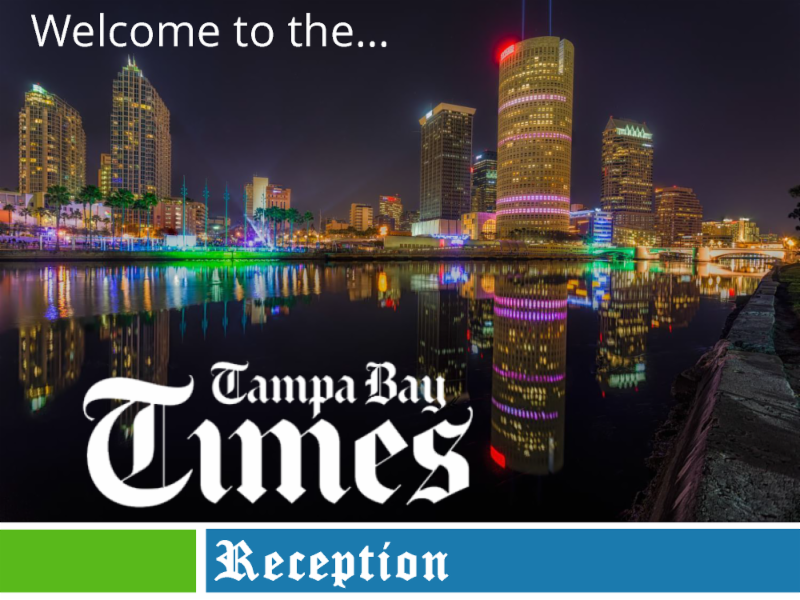 With its organic evolution, it continues to shine a bright light on City of Tampa – a colorful, innovative light that draws and excites people and makes our beautiful Hillsborough River glow and Downtown Tampa shine. Sky Striker’s interactive urban experience transformed Tampa’s iconic Rivergate Tower into a giant carnival game. 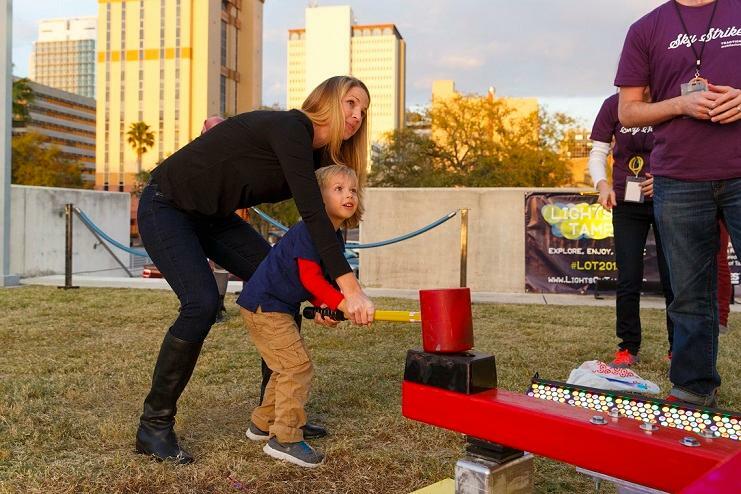 Making its debut for Lights on Tampa 2015, Sky Striker’s participants – young, old, big and small – lit up the city’s skyline by swinging a mallet and striking a carnival high-striker connected to 240 LED light fixtures throughout the 31 floor cylindrical skyscraper. With each hit, the puck shot up the machine simultaneously illuminated rings of light around the Tower. Sky Striker rung the judges bell, viewing this as an interactive, place-making event. The installation fostered a sense of wonder and playfulness, facilitating interaction among citizens, connecting people to place and one of the City’s great architectural icons. The judges applauded the success of planning for the new library by engaging the community at workshops and working closely with the Friends of the Seminole Heights Library to listen and incorporate their suggestions into the design. The judges called the exterior fabulous and a beautiful reflection of the bungalow and mission style context of the neighborhood. Congratulations and thank you for building a library truly loved by this historic community, the City of Tampa and Hillsborough County! Snowden Park is near the geographic center of the community in the predominately African-American neighborhood of Madison Park. The judges loved the responsible remediation and community engagement that resulted in recreational opportunities in a safe and healthy environment for this community. The positive impact of this newly refurbished centerpiece for community activity can be seen on the faces of the park-goers of all ages. Congratulations to the City of Plant City on a job well done! 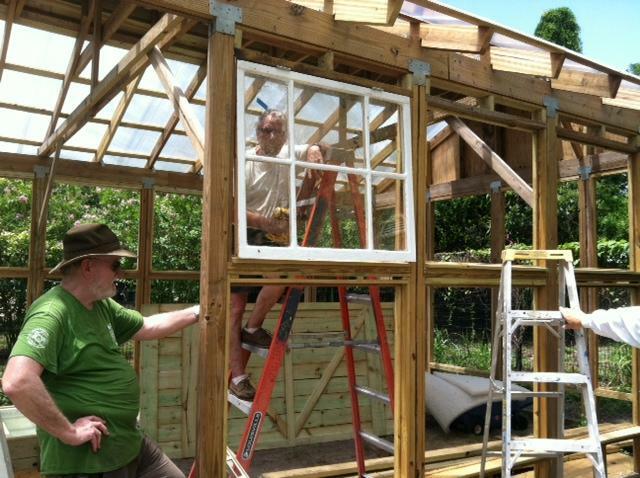 A unique structure designed to incorporate restored, salvaged historic windows in a style befitting the fabric and history of the Tampa Heights neighborhood, the Greenhouse inspired 420 volunteers from throughout the County to work tirelessly for 7 months to accomplish an extraordinary feat. It also houses a cutting edge aquaponics installation. 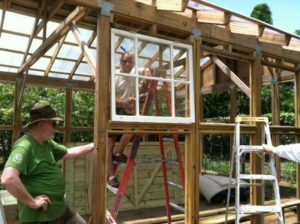 The Tampa Heights Community Garden Greenhouse provides access to healthy foods in this urban neighborhood; and it has planted the seeds for an enhanced quality of life socially and culturally. The judges viewed the Greenhouse as a ray of sunshine in the community and a shining example of sustainability, extreme community involvement, and re-purposing to conserve historic artifacts. 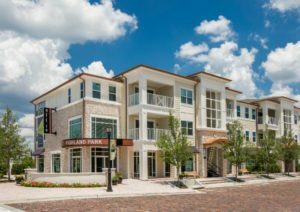 The Marq at Highland Park is sited along a major corridor in the trendy Westchase area of Tampa and serves as a gateway to an established Highland Park neighborhood.The judges were ready to sign a lease at The Marq. 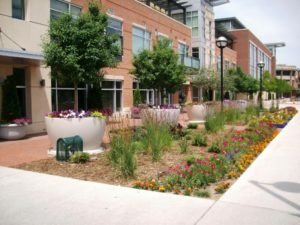 Recognizing very high quality inside and out, this development was designed in concert with the immediate neighborhoods to activate pedestrian walkways, parks, green spaces, and amenities to create a real sense of community and participation. Pushing the envelope by introducing mixed uses in this suburban setting, The Marq’s intriguing design elements harmoniously weaving together distinctions in architectural features and mixed uses definitely hit the mark with our judges! 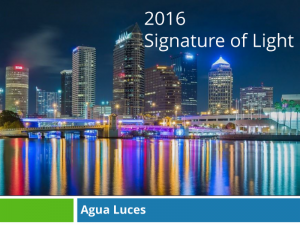 The Planning Commission with presenting sponsor Tampa Electric & Peoples Gas recognized the City of Tampa for Agua Luces, the stunning bridge lighting throughout Downtown Tampa, as an iconic Signature of Light for our community. 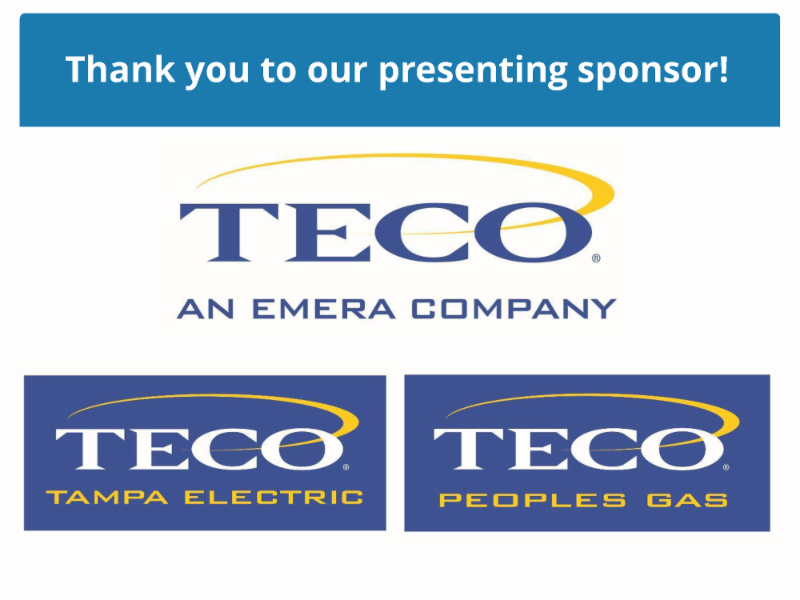 Led by Mayor Buckhorn, the Lights on Tampa Committee, and community partners Tampa Electric / Emera, the Tampa Hillsborough Expressway Authority and the Florida Department of Transportation, Agua Luces is in an initiative to light nine landmark bridges in Downtown Tampa. To date, five of the nine bridges have been illuminated by lighting artist, Tracey Dear – turning the Platt Street Bridge, Brorein Street Bridge, Tampa-Hillsborough Expressway Authority overpass, Kennedy Boulevard Bridge, and the CSX Railroad Bridge into works of art. Agua Luces originally encompassed the cleaning-up and lighting of five downtown bridges just prior to the city hosting the 2012 Republican National Convention. The bridge lighting provided gorgeous nighttime shots of Downtown Tampa, which were broadcast to hundreds of millions of people around the world. To this day, the bridges provide an enriched nighttime Riverwalk experience and have become a beautiful and colorful iconic symbol letting our downtown shine. 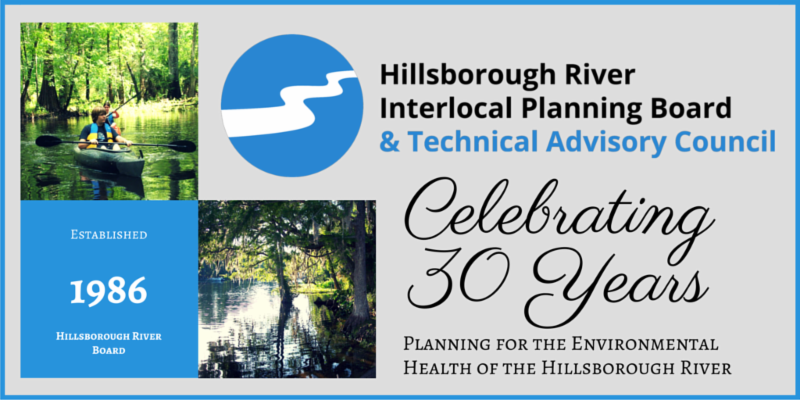 Celebrating their 30 year anniversary, the Hillsborough River Interlocal Planning Board and Technical Advisory Council proudly presented their second annual Stewardship Award recognizing leadership and dedication in the protection of the health and well-being of the Hillsborough River. This years’ recipient served as the Tampa Riverwalk Development Manager beginning in July 2004. This was a new position created to bring the City of Tampa’s Riverwalk from its 1976 inception under Mayor William Poe to completion. 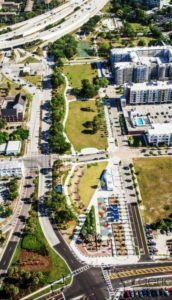 Lee Hoffman was charged with developing a master plan and, subsequently, with the planning, designing, and construction of the 2.3 mile winding trail along the Hillsborough River. Under his management, the Tampa Riverwalk vision became a reality and was completed in June 2016 under Mayor Bob Buckhorn, four decades and six mayors later. 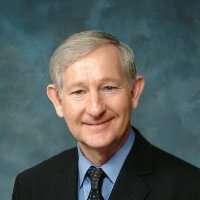 In addition to his City role, our recipient also served as a founding member of the Friends of the Tampa Riverwalk Board and served on its Executive Committee since its inception. Congratulations to Lee Hoffman! 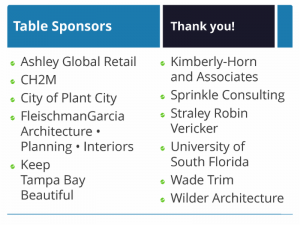 Planning Commission Executive Director Melissa Zornitta, AICP, recognized The Estuary, a 150 acre site with 16 parcels born from a partnership between Verardo Capital and Hillsborough County. Led by then Board of County Commissioners Chair Ken Hagan, a unique public-private partnership was developed between the county and the developer; a $6.25 million subsidy from the County served as the catalyst to help fund qualifying infrastructure improvements. 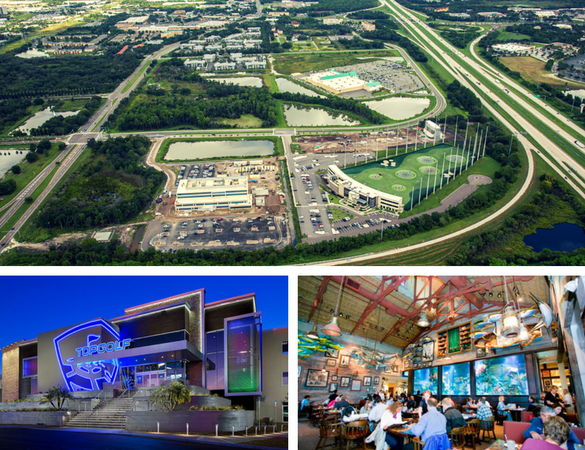 This innovative multi-use project broke ground just off of I-75 and the Lee Roy Selmon Expressway in Brandon in April 2014.  The project, once fully complete in 2018, will feature a mix of entertainment, retail, office, restaurants, hotels, and multi-family residential development, adding a significant complement to Brandon’s already extensive offerings. Bass Pro Shops and Top Golf have been a grand slam for sports enthusiasts, entertainment lovers, and diners alike. The Iris Crosstown Walk Apartments are a stunning place to live in the heart of all the activity. 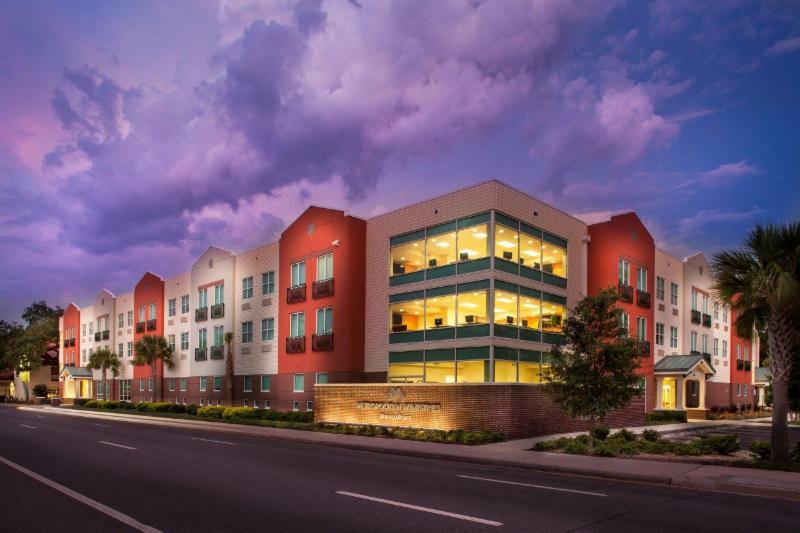 Tampa General Hospital has recently completed construction. And soon to join the line-up are Dave and Buster’s, an indoor skydiving experience called I Fly, the online car dealership Carvana, plus two new hotels. The Estuary has exceeded all expectations as a generator of economic development and truly is becoming a great place to live, work, shop, dine, or play in its own right, and rapidly becoming a destination location for the entire Tampa Bay region. 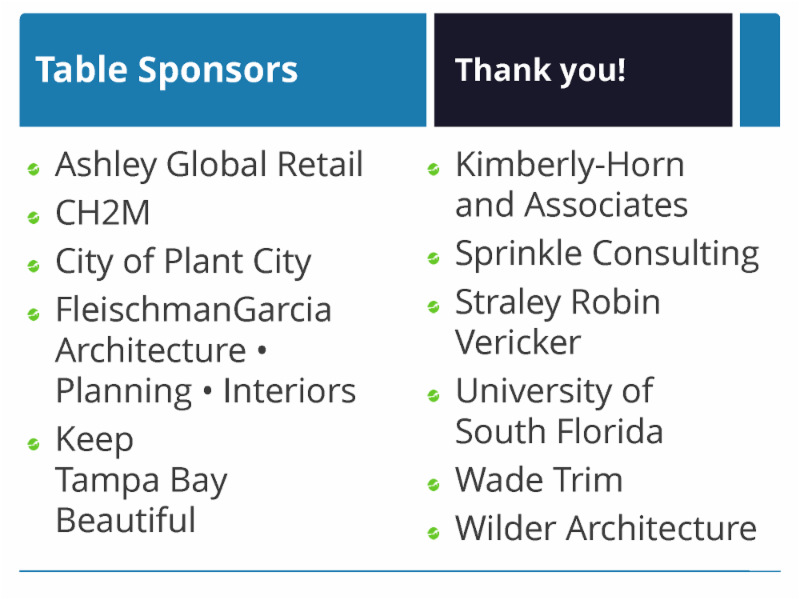 Congratulations to Verardo Capital and Hillsborough County for The Estuary and the many other consultants and developers involved in this project – a superb example of a public-private partnership in development, contributing the quality of life and economic development in our community. Repair of the storm water / sewer system and replacement of a water main are also making a big difference for the community. These improvements are reconnecting a neighborhood that has been disjointed for decades by a dangerous roadway and are helping to facilitate redevelopment of many long-time vacant parcels along the corridor. 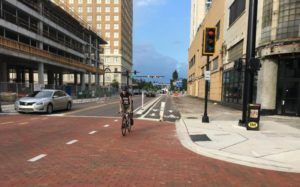 Using the 2005 and 2010 Ybor City Vision Plans and extensive community input, 21st and 22nd Streets can now better accommodate not only cars, but also pedestrians and bicyclists. Only a few weeks since completion, this project is already attracting new redevelopment along the corridor. Thank you to the Florida Department of Transportation and the City of Tampa for your cooperation, coordination, commitment, and hard work to create a safer and more desirable experience for all people and modes of travel along this significant corridor. 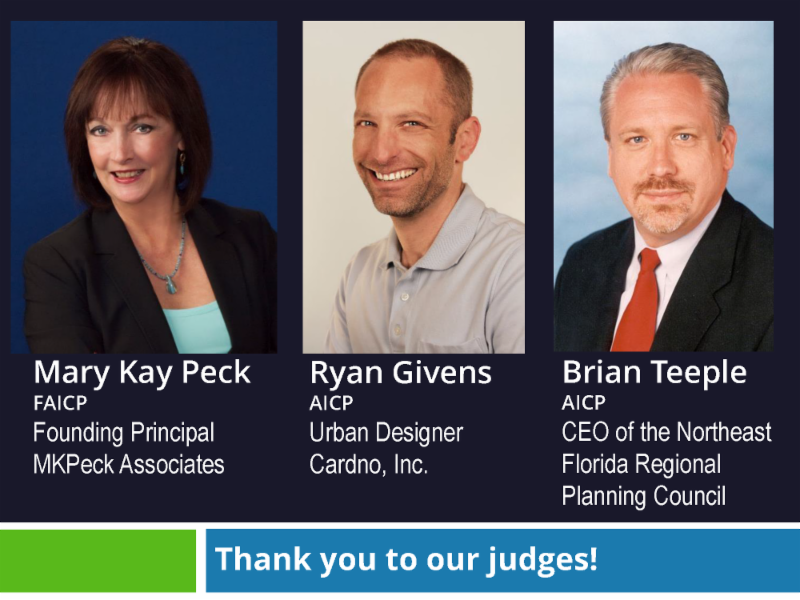 THANK YOU TO OUR JUDGES AND KEY SPONSORS! Proud to kick off Tampa Bay Design Week!